Residents of Shiregreen Estate in Sheffield have become Dementia Friends, thanks to a special event held by Sanctuary Housing to mark World Alzheimer’s Month this September. 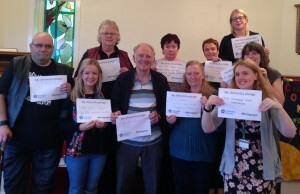 18 local residents joined Sanctuary staff members at a Dementia Friends Information Session on 21 September, led by the housing provider’s community investment project officer Cherry Shagan, who is also a Dementia Friends Champion. Set up to commemorate World Alzheimer’s Month, the Session encouraged attendees to carry out a range of activities – like volunteering, campaigning for positive change or visiting someone living with dementia – to help create a more dementia-friendly community. Participants in the workshop were given a general introduction to dementia and what it is like to live with the condition, before taking part in a discussion around turning that understanding into positive action. Sanctuary’s neighbourhood partnerships officer Sophie Kirk attended and said: “The workshop was informative and eye-opening, and I’m proud to say I’m now a Dementia Friend. Kath Horner, chair of Sheffield Dementia Action Alliance, commented: “The National Dementia Declaration for England (2010) identified that people with dementia want to be part of communities that empower them to feel valued, understood and part of community and civic life. To become a Dementia Friend visit the website. This entry was posted in Dementia Friend Sessions, Home on September 28, 2015 by Dementia Friends.